Comments: CLAMP at their most elegant. 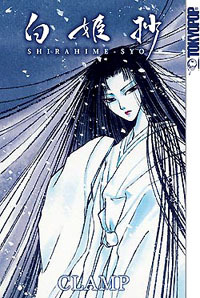 Shirahime-Syo is a collection of short stories all relating in some way to the legend of the Snow Princess. According to folklore, when snow falls, it is because the mysterious Snow Princess is crying. It is also said that when she arrives upon the frosty mountains of Japan, death is not too far away. In this release, CLAMP will divulge what they believe to be the true source of snow. From the binding alone, you may be able to tell that this is not your typical CLAMP tale. Much like the Snow Princess herself, the work is chilling. It's not chilling in the way a horror novel would be, per se, but there are some Shakespearean twists and moments of tragedy that quickly set this title apart from the happier, brighter CLAMP releases I've read before. I don't mean to scare away potential readers, however, for while this isn't CLAMP at their most cheerful, it may be CLAMP at their storytelling best. Of course, Shirahime-Syo isn't notable merely for the interesting story. The artwork is much more delicate than any other CLAMP title. I've been a fan of the ladies' style ever since I picked up Magic Knight Rayearth, but Shirahime-Syo is a step above anything else they've done. It has the flavor of something a bit more epic, a bit more grand, despite consisting of just a few short stories. The artwork utilizes a mix of fine lines and broad brushstrokes, similar to works of ancient Japanese art. There's a timeless quality here that isn't present in many other manga available today, and it's as striking as it is beautiful. Unlike everything else CLAMP has released domestically before, there is no humor in Shirahime-Syo . It is an emotionally powerful manga, but there's more despair, sorrow, and bittersweet feelings here than the typical campy goofiness I've come to expect from the creators of Cardcaptors and Angelic Layer. There are no cute fuzzy creatures like Mokona or Kero-chan. There's a complete absence of young love, as seen in CLAMP School Detectives or Man of Twenty Faces. As a release from CLAMP, this title stands alone in content. The overall tone is morose, but it's enthralling nonetheless. I found myself entranced after reading the first story. This is powerful stuff, and rather appropriate for the season. Shirahime-Syo is one of the highest-quality manga releases ever produced in North America. The book is unflipped, though English equivalents of the few sound effects used in this piece were added to some scenes. It's a hardback book (a first for TOKYOPOP manga, though they have released artbooks in hardcover before) and more than an inch taller and wider than their standard manga editions. Altogether, with a haunting image of the Snow Princess on the cover, chilling use of purples and whites for the spine, and a few pages of color in the front of the book, this book would make an excellent gift for Christmas. In fact, the book is good enough that you'll probably want to keep a copy for yourself, as well. This is classic fantasy, reminiscent of the best fairy tales of old, brought to us by the kind folks at TOKYOPOP. There's always room for more CLAMP, and frankly, I'll take this over the lighter stuff any day.